Cockroaches are a very common pest that carry diseases and are known to give people allergic reactions. They are difficult to get rid of on your own, and can infest your home quickly. Family Pest Solutions can help exterminate cockroaches from your home with our pest control services. We begin with a detailed inspection, follow up with some reports, and then give you some recommendations on what the next steps should be. You may even need a monthly pest control service in order to fully combat a possible infestation. We will let you know in the recommendations that we give after our initial inspection and report. 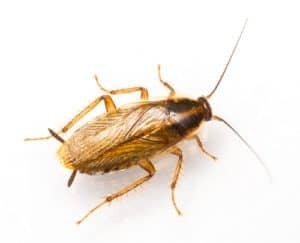 We don’t only offer cockroach control to residences; if you own a business, and have an infested commercial building, we can exterminate cockroaches in the building. Shortly after mating, cockroaches will lay cases of eggs that each have about 15 embryonic cockroaches in them. Each female cockroach may lay up to 6 egg cases, also known as an ootheca. Once the eggs are lain, they will “hatch” between 24-38 days. Newborn cockroaches are called nymphs, and they will undergo metamorphosis up to 13 times before they are full adults. After nymphs finish their metamorphosis cycles, they become adults with wings and can then reproduce and lay even more egg cases. It can take as little as six months, or even up to a year for a cockroach to reach adulthood. Cockroaches live a year, on average, and can live up to 3 months without eating anything, making them a very resilient pest. Cockroaches are very unique, and easy to identify. They are flat, oval shaped, and have a brown color to their body. They have wings, allowing them flight capabilities. Not all cockroaches fly with their wings, however. Roaches are very fast, using their six legs to traverse many types of surfaces. It is common to find them taking a stroll on walls. DO I HAVE COCKROACHES IN MY ALBANY HOME? Aside from visibly seeing a cockroach in the daytime, there are other signs that can help you discover if you may have a cockroach infestation on your hands. These pests are nocturnal, so it may be difficult for you to know if you have any of these unpleasant invaders. Seeing bodies of roaches. This is a more obvious sign, but can tell you if you have a major infestation in your home. Look out for egg cases – these are common behind furniture or other hidden, dark places. HOW DO I PREVENT COCKROACHES FROM INFESTING MY HOUSE? Cockroaches thrive off of water and food, which aids in survival, their main driving force. Avoid leaving out food, which can include dirty dishes sitting in your sink, and avoid having any water buildup in your home. Also, do a run through of your house checking for cracks in your home. Roaches can flatten their body and fit into very small areas. You can use caulking to seal any cracks you find. We also recommend getting rid of any cardboard boxes laying around, or stacks of magazines hidden in dark places. The bottom line is, making sure your home is kept clean and free of food bits and roach-friendly living scenarios is the best preventative measure. Whether you live in Albany, NY, or even Troy, Schenectady, or Clifton Park, Family Pest Solutions can help you exterminate and prevent roaches from returning to your home or commercial structure. Give us a phone call or use the contact form on our site to get an estimate or an inspection started. We will perform a detailed inspection and report, following up with recommendations on how we should proceed to eliminate and remove cockroaches from your residence or building.